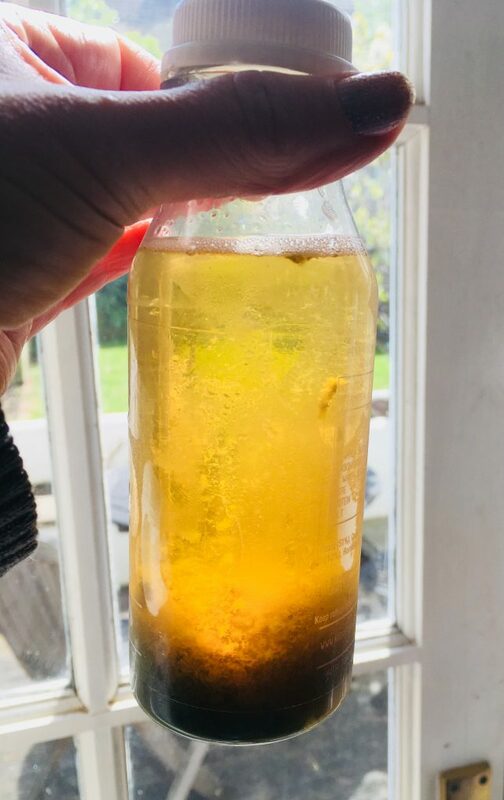 Yes, I know the picture above looks like something died in the bottle, but this time last week, that was what passed for lunch as I set off on a three day juice cleanse. That’s three days with only fruit and vegetable juice to sustain me (and no food, tea, coffee or alcohol – not even crisps! Can you imagine life without crisps?). Long time readers will know that almost exactly four years ago, I did a four day juice cleanse and lived to tell the tale. After that, I went totally mad for juicing. Bought a juicer and everything. I would do mini one day juice fasts when I wanted to clean the pipes. Eventually I got bored of all the faff of the juicer and gave it away. Smoothies are my thing now, there’s less mess. Roll on a few years and I was feeling a bit run down and in need of some pure, junk-free nutrition for a few days. Also, I had run out of crisps. As I didn’t have the juicer any more, plus I am lazy, I bought in a pre-prepared three day juice cleanse from a company called Nutriseed. The 15 juices were delivered frozen, and all I had to do was take each day’s juices out of the freezer each night, ready to defrost for the next day. Second time around, the prospect of life on juice was way less scary. The big lesson from my first juice cleanse was that you don’t actually feel hungry. Those tiny bottles are enough to sustain you, and you don’t spend the whole time howling at the moon in a fury of hanger. First thing: sliced up lemon & hot water. Repeat at length throughout the day. 2pm: Broccoli, Lettuce, Celery, Pear, Chia seeds, Cucumber – horrid. Juicing broccoli should be against the law. But even though I didn’t particularly enjoy the taste, I did enjoy the process. It was like going on retreat whilst staying at home. Day 1 was the toughest. I felt a bit headachey and light-headed at times as my body wondered where all the food had gone. Days 2 and 3, in comparison, were a breeze as long as I avoided the scent of anybody making toast. Lovely, lovely toast….. I didn’t go to the gym, but I did do my daily 12k steps, mostly by running back and forth to the loo. I lost 5.5lbs over the three days. The myth with juice cleansing is that you’ll put back on any weight you lose pretty much as soon as it ends. In my experience that only happens if you go back to eating exactly what you were eating before, or if you start over eating to make up for feeling deprived when you were juicing. A week on, I haven’t regained the weight and have lost a little more. This is because I just don’t fancy biscuits and crisps the way I used to. I’m sure that won’t always be the case, but for now I am weirdly addicted to apples and large amounts of herbal tea. 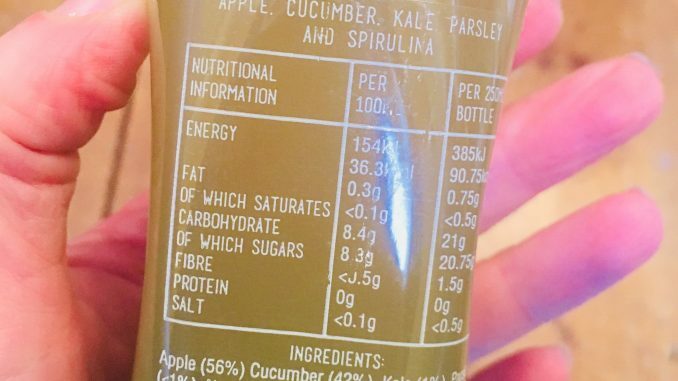 The down side to juice cleansing is that inevitably it’s quite anti-social. You’re hardly going to go out for dinner with friends and sit there sipping a kale and spirulina mix. And afterwards all you can do is gop on about how great apples are and how running to the loo every 15 minutes is absolutely fine. So either keep quiet about it or brace yourself for people thinking you’re a bit freaky and backing away from you in case you steal their crisps. All in all I felt really good at the end of the cleanse, really quite super-charged and full of energy. How much of this is down to the juice and how much is down to taking a step back from regular life for a few days, I’m not sure. I know it’s not a detox, since the body is already perfectly well-equipped to detox itself. It’s more like giving yourself a rest, and who wouldn’t benefit from that? 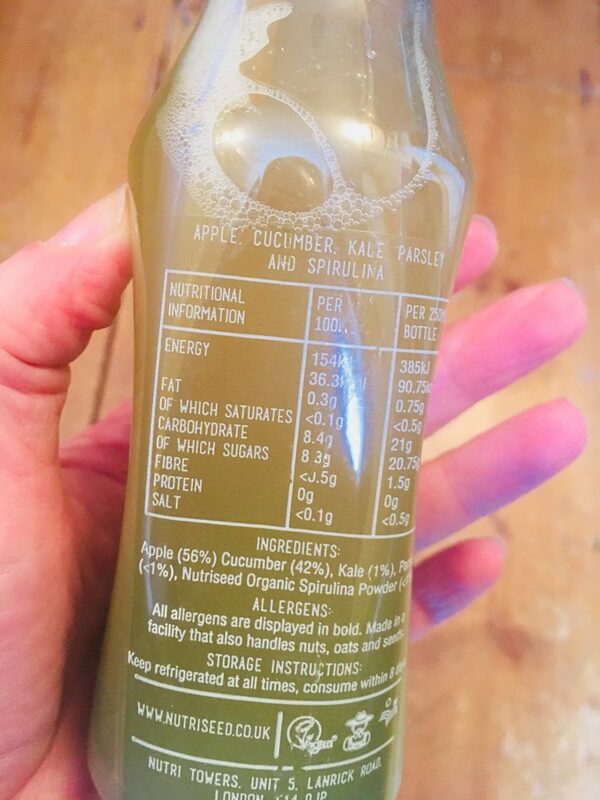 I would also recommend Juicytox, who supplied the juices for my first cleanse – the only reason I didn’t go with them this time is that their cleanse is 4 days and I wanted to do 3. The other difference between them and Nutriseed is that the Juicytox juices are delivered fresh, not frozen.